LCI's Power Stabilizer easily retract and extend with the flip of a switch. After a long trip, cranking manual scissor jacks can be a long and strenuous process. LCI's Power Stabilizer easily retract and extend with the flip of a switch. In just a few minutes, the coach will be stable without having to break a sweat! Spend less time setting up camp and more time enjoying your vacation. LCI Power Stabilizer are an affordable way to upgrade to power leveling and easily bolt-on to your existing frame. Powder-coated heavy-gauge steel legs adjust to the terrain using just one motor. 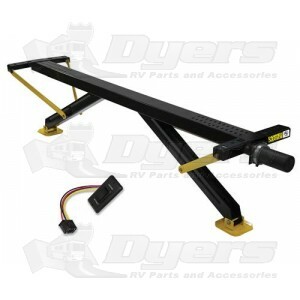 - Legs extend up to 30"
This is a the best price for this rear stabilizer I've been able to find. It's an upgrade to Lippert's older 298707 kit. This one has a faster motor which lowers/raises the legs twice as fast. Kit comes with required hardware, an auto-reset circuit breaker, a waterproof switch, and stickers. Also has plenty of cable to route to the switch. The only thing it doesn't come with are instructions, which dinged one star off for quality. Instructions can be downloaded from Lippert though. New - not replacing old: Hook the switch up to a 12v source (I installed it permanently first), and then to the stabilizer with circuit breaker on the hot leg. Raise the stabilizer in place (using the switch). Route cable where you want it. Drill 3/8" holes for bolts into RV frame. Bolt on. Raise legs. Replacing old one: Lower old stabilizer legs. Unbolt and lower it to the ground. Hook the switch up to a 12v source (I installed the switch permanently), and then to the stabilizer with the circuit breaker on the hot leg. Raise the stabilizer in place (using the switch). Route cable where you want it. Bolt new stabilizer to RV frame using original holes. Raise legs.